Credit: NASA/James Round. Download this image (JPG, 97.9 KB). [14-Jun-16] Field campaigns require strategic planning to coordinate researchers, equipment and timing to keep interruptions at a minimum. One key area of planning outside of the control of researchers is the weather - who keep a watchful eye and adjust their plans to get the most out of short sampling opportunities. 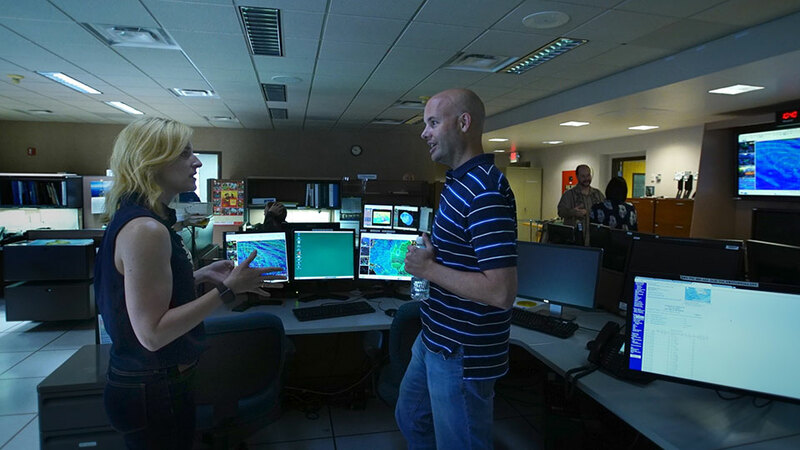 In this photo, Meteorologist John Jelsema discusses an upcoming forecast with CORAL project scientist Michelle Gierach.